There’s something wonderfully glowing about Djemaa el-Fna in Marrakech. As the sun goes down it’s one of the most vibrant places anywhere. Ahh this photo makes me feel warm and I can smell the morning air in Jemaa el Fna, ripe with fragrance of the sweetest orange juice anywhere. Just a few circles in my square today Becky! Accor Hotels have a competition that invites bloggers to write about one of their favourite cities. The idea is to show three reasons why you love it and the prize is three-night stay for two, in London, Paris and Amsterdam. They’re including transport by Eurostar and even spending money, doesn’t that sound wonderful? One of my favourite cities is Marrakech, a passion that began way back in 1969 when Crosby, Stills and Nash released the track Marrakech Express. I was very young, but something in that song intrigued me, from then on Marrakech seemed like a very exotic destination, even though at the time I would have struggled to find it on a map. A few years ago I finally made it and it didn’t disappoint one bit, in fact I loved it so much I returned for a second visit. It’s difficult to narrow it down to just three things I love about it, but the first I’ve chosen is Les Jardins Majorelle. Originally created by the artist Jacques Majorelle, who devoted forty years developing it into a lush paradise. The intense ultramarine cobalt colour that he used abundantly through the garden, later came to be known as Majorelle blue. 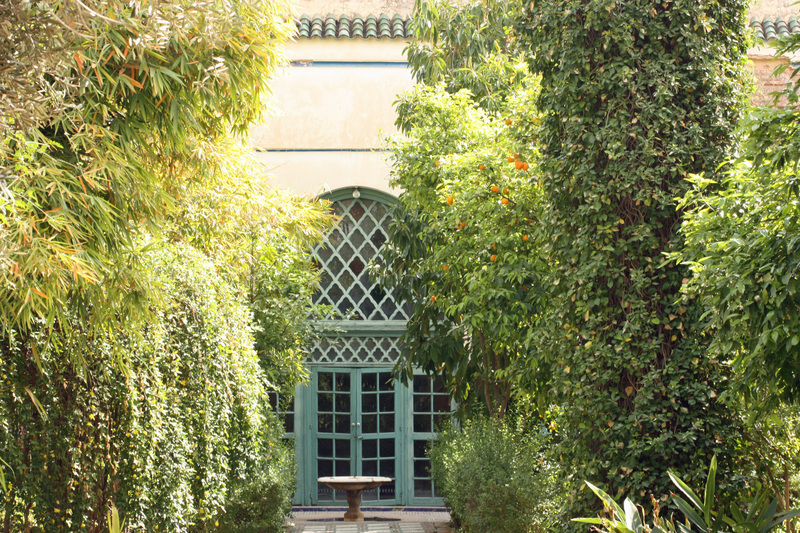 When Majorelle passed away, the garden became neglected and would have been destroyed and replaced by an hotel, had it not been for the vision of Yves Saint Laurent and Pierre Berge, who bought and began the restoration process. There is now a memorial to Saint Laurent in the garden and Berge gifted it to the Foundation Pierre Berge and Yves Saint Laurent. Bahia Palace – meaning ‘the beautiful’ was built in the 19th century by Grand Vizier Si Moussa. It has two acres of gardens and around 160 rooms, some of which are open to the public. The main attraction for me is the ornate tile work on floors, walls and ceilings. 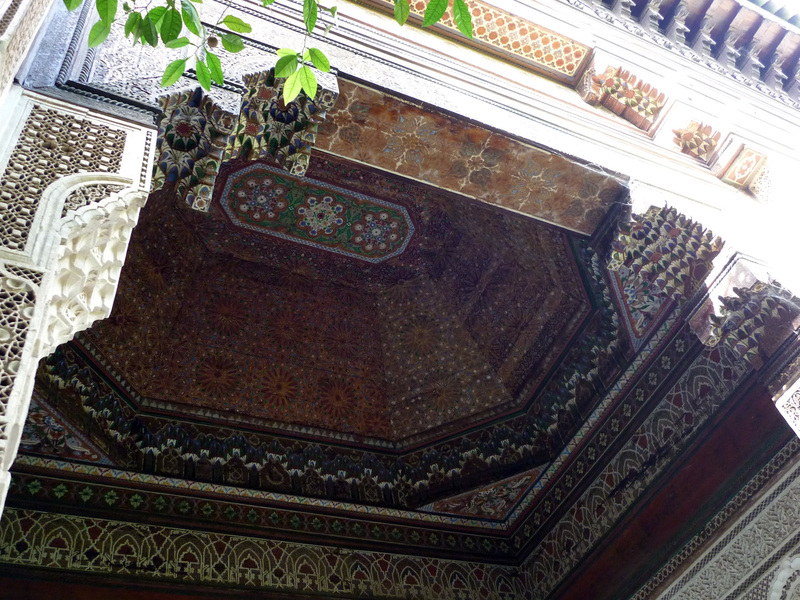 These are multicoloured Zellij mosaic, in Islamic, Andalucian and Moorish style, with green ceramic roof tiles. There is also some delicate stucco work that reminds me of the jail screens in Rajasthan – used in the womens quarters of major palaces as well as havelis. Naturally the Bahia once had a harem filled with concubines. 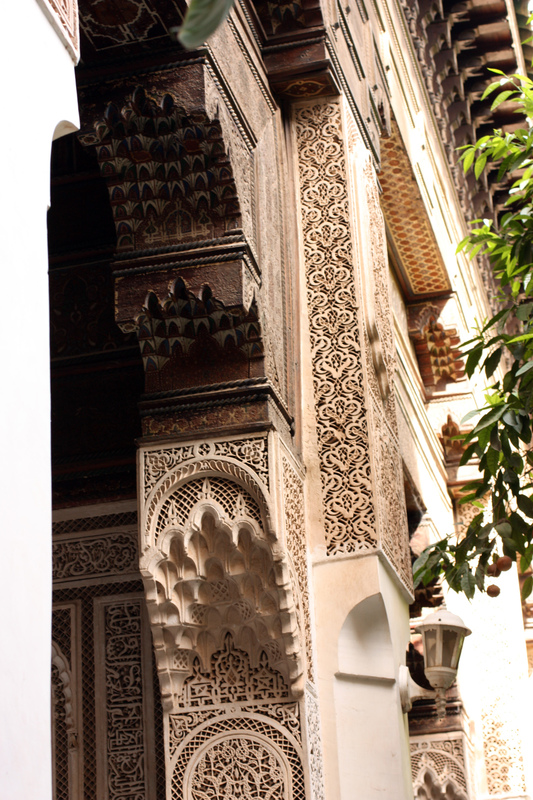 The palace can be found in the medina, next to the Jewish quarter and is open daily, unless there are royal visitors. 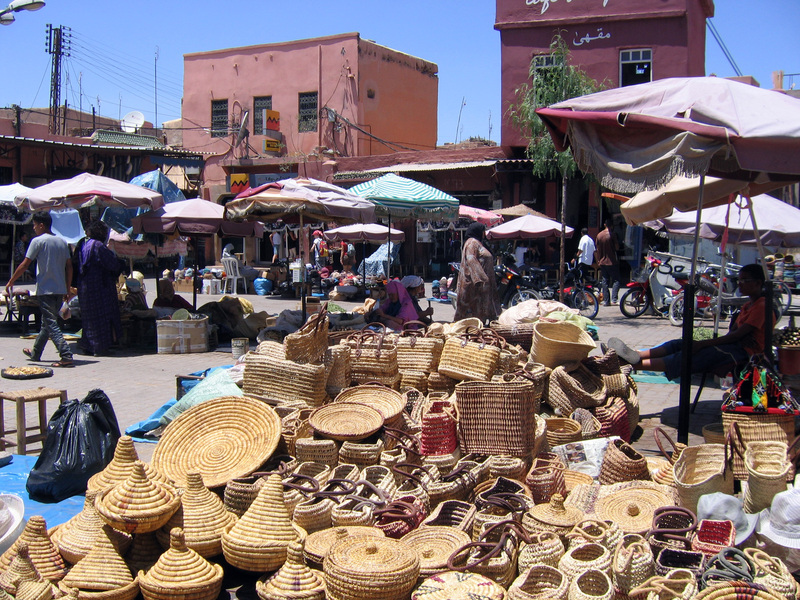 It is one of the cheapest places to visit in Marrakech, about a pound, plus a small tip if you have a guide. Last but not least on my list, is La Place Jemaa el Fna, a UNESCO world heritage site for ‘the Oral and Intangible Heritage of Humanity’. I think it’s a love it or hate it kind of place, that many would describe as crazy and impossible. By day the vast square is a sun trap, only copious quantities of the best and cheapest orange juice ever will keep you going. Luckily the stalls are everywhere, as are the caleches, ready to take you around the city for a negotiable fee. As the sun begins to go down, if you want to take it easy, head for one of the roof terrace cafes, and sit back and enjoy the spectacle. Every night, La Place is transformed into a huge open sea of eating places and it has to be tried at least once during your stay. The food is freshly cooked and the air quickly fills with smoke, but its tasty and authentic. Anything thing you want, and an awful lot of things you didn’t know you wanted, can be bought around the square and the souk. If you show any interest in an item they will do their utmost to get you to part with your money, but I found it to be good natured haggling. Before you leave the square, have a wander through the crowds. You will find snake charmers, tooth pullers, henna artists, story tellers, fortune tellers and monkey handlers – I’d avoid those if I were you! I hope you enjoyed visiting Marrakech with me, the competition ends tomorrow but if you’re very quick . 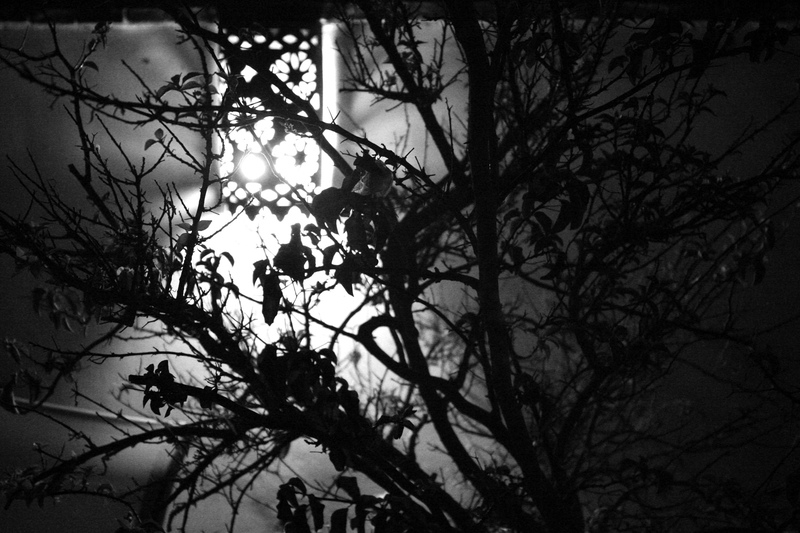 . .
Ben Huberman at WordPress asks us to post a nighttime photo for this weeks challenge. I haven’t really got very many, I’m to lazy to use a tripod and I don’t take my camera out much at night. I did find this one though, taken at a Riad in Marrakech a few years ago. 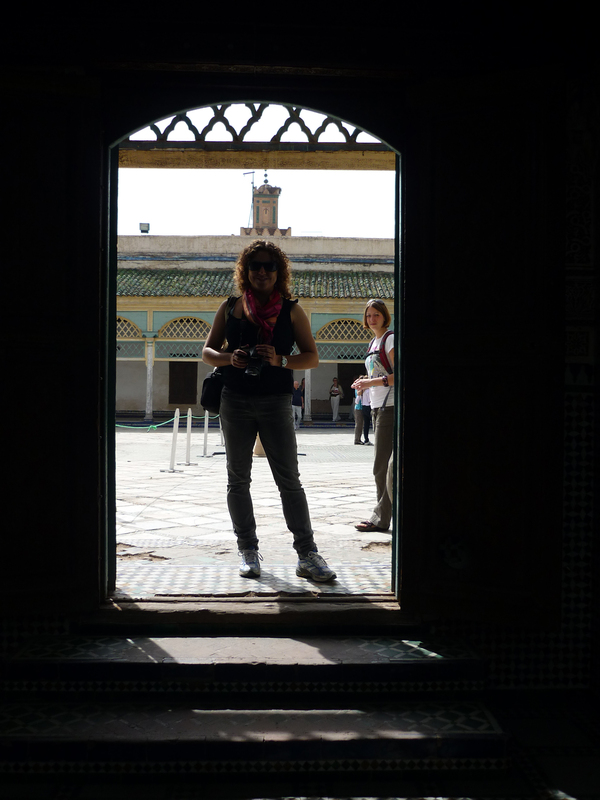 Take a stroll through the medina in Marrakech and you will find the 19th century Bahia Palace. 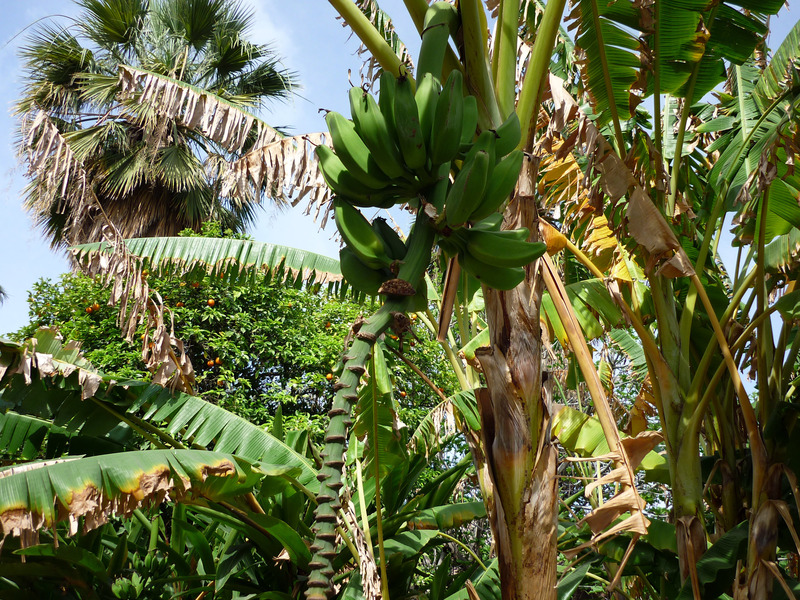 The entrance takes you through lush gardens with banana, bamboo, bougainvillea. Look up at each threshold, the tiled ceilings are beautiful. And so is the Jali. Take a peep through at your daughter if she came too. Glimpse through to the courtyard. and look through the window to a room that was once a concubines. 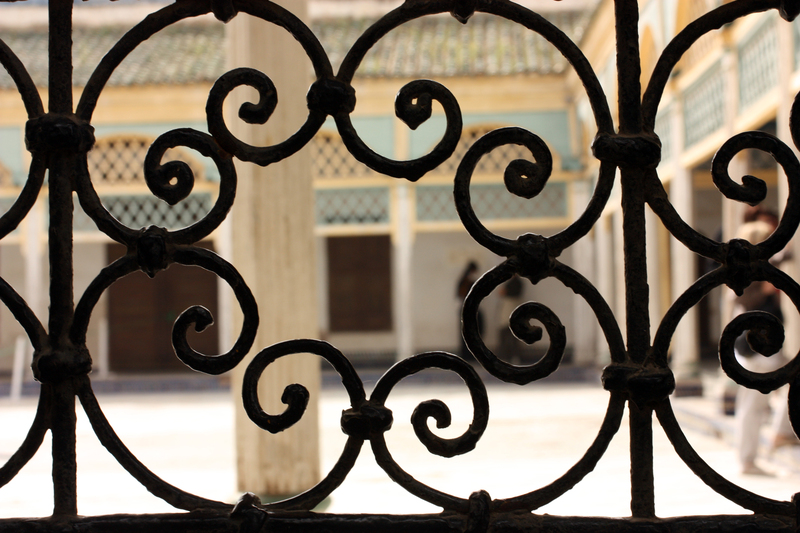 In the heart of the medina in Marrakech lies a beautiful haven of peace. Even it’s name, Houdou, means serenity, in Arabic. It’s a 17th century mansion, with an inner courtyard, shady and green with citrus trees and the ever present buntings chanting their song. The roof is part shaded and part in full sun, a lovely place to rest and enjoy a view of the Atlas on a clear day. There is a hammam and if you’re too hot from shopping in the souk, there is a plunge pool to cool you down. Food is freshly prepared, local but with influences from the French owners. I’ve tried to show you what it’s like INSIDE a traditional riad, I hope you like it and if ever you visit Marrakech I recommend it highly! Can you show us Inside? Maybe you would like to see other interpretations to inspire you.